While discussions are going high on the development of Snøhvit in the Barents Sea and on extending the exploration in the Norwegian Sea further north, Scandinavian Oil-Gas Magazine visited what is currently the northernmost production of oil and gas on the Norwegian Continental Shelf. Norne is not only Statoil’s northernmost field in production; it is also the company’s best performer. The Norne FPSO is a prime example of a well-run installation. ‘We are proud of what we achieve here,’ says Platform Manager Arvid Skaar. Assistant Production Manager Tom Roger Tollefsen agrees. ‘We have both been involved in the project since the planning and construction of the FPSO started, and we feel a strong sense of ownership,’ they admit. ‘But the results speak for themselves, we run a smooth operation here,’ they smiles. The same satisfaction is found among all the workers at Norne. They are proud of their work, feeling they make a contribution to the society. The Norne crew has good reason to be proud. 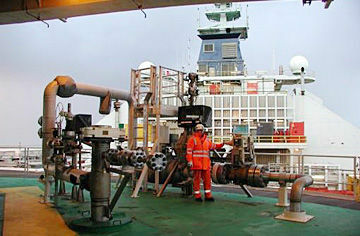 The FPSO has a steady and high output. The week Scandinavian Oil-Gas Magazine visited the vessel they were busy with maintenance work, which reduced the capacity that particular week. But the following week, in early March, Norne totally outshined all Statoil installations with a production record of over 236,000 b/d of oil. At the contemporary oil price of about USD 19.8 per barrel, that meant the daily output at Norne was approximately NOK 42 million! ‘That is a lot of money also to the state treasury,’ Skaar says with a smile. ‘We feel it is important to keep in mind the high income we are generating, because it is difficult for ordinary people to understand the figures we are talking about here,’ he continues. The recent increase in production is partly due to the removal of bottlenecks in the production facilities and in the production wells, such as large pressure drops at the valves. This has helped to increase the oil flow. The field is currently producing from nine wells. There are two wells in particular that produce large volumes of up to 50,000 barrels per day each. On good days the field produces around 15,600 barrels above the design capacity of the production ship. ‘But in the long run the good regularity at the facilities is important in keeping a constant high output,’ Skaar points out. Assistant Production Manager Tom Roger Tollefsen in front of the physical evidence of Norne’s gas production, which is transported 1400 kilometres to continental Europe. 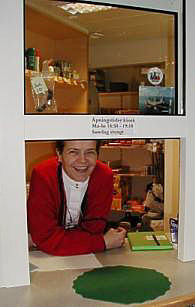 Anne Beate Lindebøe is head of the catering and helicopter service at Norne. She seems to be of assistance everywhere, selling chocolate at the kiosk, or sending people to and from the mainland. A smooth operation is not the only reason why workers at Norne seem very satisfied. The unity and close co-operation is another factor. This is achieved among other things by giving employees various tasks. For instance, people working in catering are also responsible for the helicopter service. ‘That way we feel we are given more responsibility, and the routines are changed a bit during the day,’ Anne Bente Lindebø says. She is head of the catering at Norne, and of the helicopter service. If you need anything from the kiosk, you will find her there as well. ‘We are so few people here, so there is no point in having anyone regularly in the kiosk. But if they give me a ring, I am there as soon as I can,’ she smiles. On a regular shift there is about 46 people working at Norne. That is a main reason for the varied responsibilities. ‘When we are so few everybody have to be ready to be asked to do various tasks,’ Skaar explains. ‘We talk people through this before they are offered a job here. Most employees find it very positive. But those preferring a more strict work practise and more hierarchical structure might want to work on larger installations,’ he says. Skaar worked at Statfjord before joining the Norne project. ‘There we were used to a hierarchical structure, which was probably necessary with such a large organisation. At Norne each worker has better possibility to influence their working situation and to bring forward suggestions concerning their work,’ he says. Norne is situated 200 kilometres west of the coast between Brønnøysund and Sandnessjøen, covering blocks 6608/10 and 6608/11. It is about 85 kilometres north of Heidrun. The helicopter base is situated at Brønnøysund, while its land base is at Harstad. The initial investment of Norne was NOK 8.5 billion in 1994 money. Production from Norne started on 6th November 1997. Gas export began in February 2001. When Norne was discovered in 1991, it was one of Statoil’s largest finds for many years. The water depth at the Norne field is about 380 metres. It was therefore developed with a production and storage ship tied to subsea templates. Flexible risers carry wellstrams to the vessel. The risers, umbilicals and 12 morring lines are attached to a central turret that allows the ship to turn so that it is always bows-on to wind and weather. ‘That is important not least to make sure the flame from the flare boom always blows away from the ship,’ Tollefsen explains when giving a guided tour around the vessel. Shuttle tankers moor to the stern of the ship when they load oil. However, when Scandinavian Oil-Gas Magazine visited, the weather prevented off-loading. With storm bordering on hurricane through two days and nights it was impossible for the tanker even to try. ‘That is very unusual,’ Tollefsen explains. ‘During the past year it has happened only once. In fact, the weather up north is usually calmer than at the installations further south in the North Sea,’ he claims. And he should know. One of the many duties of the Norne crew is to report meteorological information to Norsk Meterologisk Institutt (NMI) every third hour. While the oil is taken ashore by shuttle tankers, the gas from Norne is exported through the Norne Gas Export Pipeline and the Åsgard Transport trunkline to Kårstø north of Stavanger. From there, lean gas is piped on to Dornum in Germany. The total distance from the field to continental Europe is roughly 1400 kilometres. The Norne field has a commercial lifespan until at least the end of 2015, but it is now at plateau production. Statoil is exploring for further finds nearby, to take advantage of the production facilities and infrastructure at Norne. Stena Don which is at work not far from Norne. A part from Stena Don and the stand-by vessel the view from the comfortable lunge and cafeteria at Norne are water and waves, waves and water. Of course, the workers do not have much time to contemplate the view. They work 12 hours shift, and have an obligation to rest between. So the rhythm is work; eat; sleep, with occasional television viewing. ‘And newspapers,’ Lindebø points out. Workers at Norne come from all over the country, so there are stacks of local newspapers keeping everyone up to date on what goes on at home.